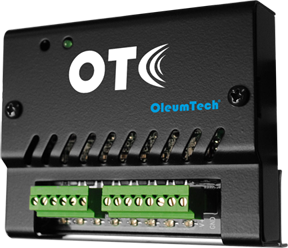 The OleumTech® Digital I/O Module is designed for easily adding discrete inputs and outputs to the DH1 Base Unit Wireless Gateway. Each channel can be independently software-configured as input, counter, output, or pulsed output. This Module supports any mix of inputs and outputs. The Digital I/O Module is certified for use in Class I, Division 2 (Zone 2) hazardous locations and accepts 9-24 Vdc external power. Its compact, small footprint form factor easily fits inside a NEMA enclosure. This Module is equipped with two RS485 Serial ports (RJ-45) for allowing multiple I/O Modules to be daisy-chained to the DH1.